There are few creatures on the planet that are more fearsome than the lion. The so-called “King of the Jungle” is massive, powerful, and cunning. 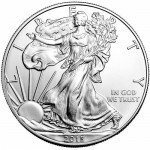 Notably associated with the African continent, the nation of Burundi capitalizes on the imagery of a lion on the popular 2015 1 oz Silver Burundi African Lion coins. 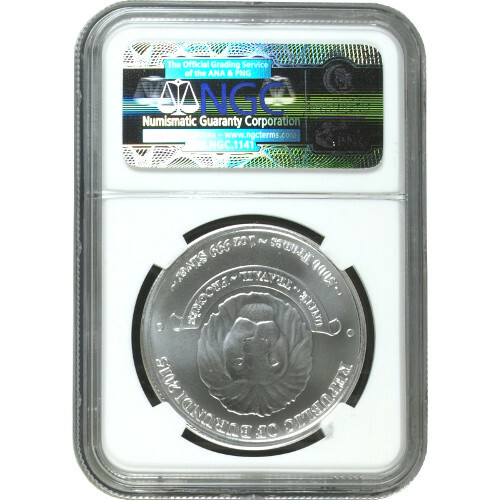 Now, you can purchase a new African lion coin with an MS 69 grade from the Numismatic Guaranty Corporation. Each of these particular coins comes from the early release edition of coins minted in Burundi, meaning that they were received by the NGC during the first 30 days of the coin’s release. Lions are known by many titles, among them the moniker “King of Beasts.” The 2015 1 oz Silver Burundi African Lion coin is the latest in the African lion series from the government of Burundi. 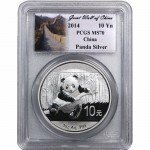 The 2015 coins feature a new design on the reverse side of the coin, and this set of coins are available from the early release set provided by the mint. 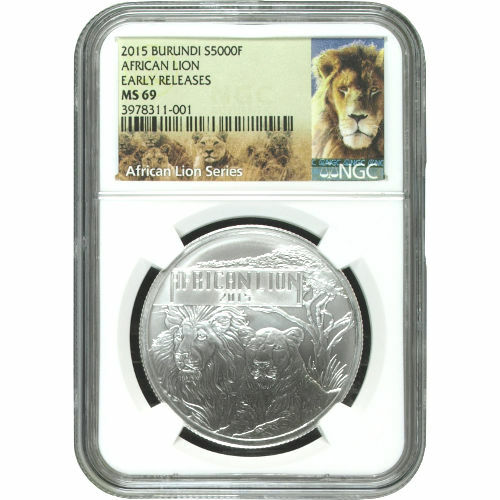 The NGC has graded these 2015 1 oz Silver Burundi African Lion coins as MS 69. A coin with an MS 69 grade has a sharp, attractive strike on the mint and year mark. Coins with MS 69 grades also have fewer than two visible abrasions. On the reverse side of the 2015 1 oz Silver Burundi African Lion coin is the image of two lions resting among the tall grass of the Serengeti. Behind the lions, a tall tree rises into the background. The engraving on this side reads “African Lion 2015.” The obverse side of the coin borrows imagery from the official Seal of Burundi. A male lion’s head is featured above the state motto “Unite-Travail-Progres.” Additional engravings include “Republic of Burundi 2015” and the weight, purity, and metal content of the coin. All 2015 1 oz Silver Burundi African Lion coins are minted by the government of Burundi and available as legal tender in that nation. If you have questions about African lion coins, other products, or the Silver.com purchasing process, don’t hesitate to contact our associates online or over the phone at 888-989-7223.